Why is religion such a powerful, enduring and divisive force in American life? Find out in this informative, accessible series, which covers four centuries of history in three brisk hours and features the insights of America’s top religious scholars. 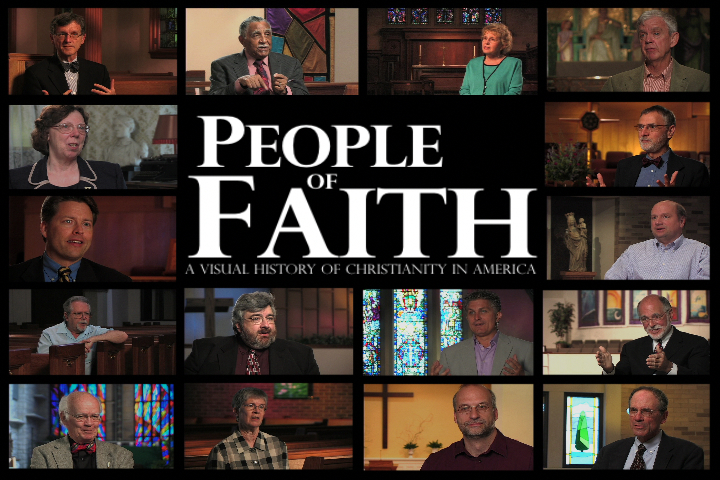 Beginning with the first European settlers who brought their faith with them to the New World, and continuing through domestic and international wars and the “culture war” issues of the 21st century, People of Faith shows how the first country in the world to be founded on the basis of religious freedom has became a place of unprecedented religious commitment, diversity and experimentation. Douglas Sweeney, Trinity Evangelical Divinity School. The people who came to the New World hailed from many places and for many reasons. The faith and religious practices they brought with them helped shape a nation where religious freedom gave birth to unprecedented levels of religious diversity, experimentation and competition. The experiences of the first immigrants to the New World and the values of the nation’s founding fathers gave America an unprecedented religious freedom. That freedom has given birth to a breathtaking diversity of Christian belief and practice. From the beginning, Americans have been people of faith, but their faith has not been confined to their churches and their “spiritual” lives. Their faith has inspired and compelled them to act in order to create a more just and moral nation. By studying American Revolution, Civil War and historic moral crusades, we can think about how to better apply our faith to the challenges we face today and tomorrow. Whenever people of faith felt they had created the ideal church or the good society, new developments and challenges arose which upset the status quo and forced them to rethink their beliefs and find new ways to apply them to current conditions. Issues explored include religion and science, Christ and popular culture. Bonus material includes study and discussion questions, additional interviews with scholars, and script transcripts. Produced by the Institute for the Study of American Evangelicals at Wheaton College with the support of a grant from the Lilly Endowment, Inc.